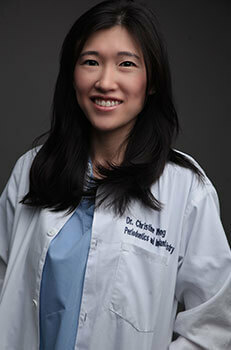 Dr. Christine Wong is a passionate dentist with a gentle and caring personality. She strives to provide the highest quality periodontal care for all her patients and believes that patient education is key to a beautiful and healthy smile. Dr. Wong received her B.S. in biochemistry from University of Texas at Austin, graduating with high honors. She earned her D.D.S. degree at New York University College of Dentistry and was awarded the David B. Kriser Award for Compassion. After completing a General Practice Residency at Bronx Lebanon Hospital Center, she continued on to specialize in periodontics and implantology at a post-doctoral program at NYU Lutheran Medical Center. Dr. Wong is proud to announce that she is a Diplomate of the American Board of Periodontology, board certified in periodontology and dental implant surgery. Dr. Wong continues to advance her expertise by participating in various Continuing Education courses and specialty meetings annually. She keeps up to date with new technology and advancements in periodontics and implantology. She also enjoys teaching and volunteer work. Dr. Wong has completed dental outreach program in Grenada and routinely volunteers in local dental outreaches. During her off time, Dr. Wong enjoys traveling, cooking, and spending time with family and friends.